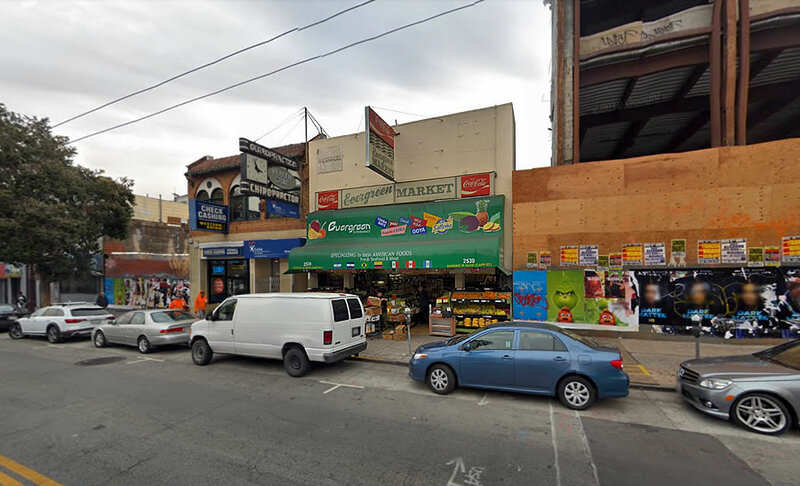 The Evergreen Market building at 2539 Mission Street is on the market with a $3.5 million price tag, not including its rear parking lot which fronts Capp Street and for which another $2.5 million is being sought. And as noted in the marketing materials for the property, the market building’s nearly 4,000-square-foot parcel is zoned for development up to 65 feet in height while the 4,000-square-foot parking lot is zoned for development up to 40 feet along Capp. The better question is what is going on with the former theater next door? I seem to recall it was going to become some sort of gym and then nothing happened and now it’s just an open box for two (??) years now. The façade of the historic Cine Latino was illegally demolished, leading to the project’s permits being revoked. Many of us have called for stronger punishment – or ANY punishment, really – for these permit scofflaws and I guess revocation qualifies as such…seems like kind of a hollow victory tho, figuratively and – here – quite literally. It seems like the real punishment is the cost of holding a property vacant for 2 years and for however much longer it takes to make the site active again which I assume is not going to be soon. Well, yes, but of course that’s the result of the revocation. A nice – as in poetic – touch would be if the permit is reinstated…w/ a condition. It will be interesting to see how that case is ultimately resolved – hopefully SS will keep us updated (UHMM!) – tho I’m skeptical a replica will actually emerge. 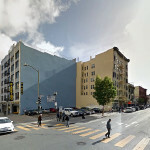 -Can the current owner/developer who illegally demolished the facade apply for new permits? 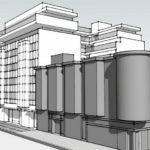 -Is there some length of time during which the current owner/developer is banned from developing the property even if they were to secure new permits? -If the current owner/developer sold the site to someone else, I would assume that new owner would have to go through a new permitting process and, assuming permits are granted, could they begin work on it immediately? I would obviously like to see the former theater developed ASAP since it is such an eyesore and I’m just curious if the current owner/developer who broke the rules would have any avenue to re-starting their work or if their only real play is to sell the project. If they should sell, it would be great to see a buyer of both that site and the Evergreen site emerge and combine the sites into one project (if possible). Why would it be great to see a buyer combine the theater and the Evergreen site? That seems easier to make profitable (would could possibly translate into additional subsidized units? ), but from a pedestrian/vibrant neighborhood/Jan Gehl perspective, a bigger building is more monotonous than multiple, narrow facades. I just want to see things move forward & get built, and I would think that 1 project would move faster than 2 independent ones. There should be economies of scale in having 1 larger project vs. 2 smaller ones so that should help keep costs down, and as you point out the net result would probably be more subsidized units than if 2 projects proceeded independently. Everybody wins, however I’m not holding my breath for that outcome to actually come to fruition. 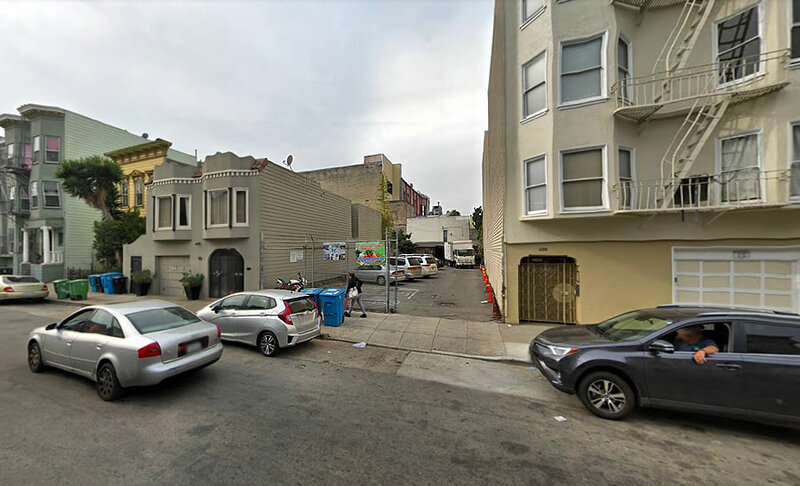 It would be about 120′ of frontage, which is not that big, and from a pedestrian perspective you can have separate storefronts that are visually distinct within the same structure. Most people walking by do not notice that, for example, Valencia Whole Foods and Dosa are part of the same building. Ah, Evergreen. In the late 80’s and early 90’s they sold “tranquilizante vitaminados” on a roll at the register. I think the police let them do it because it kept all the speed/coke/etc. users mellow.